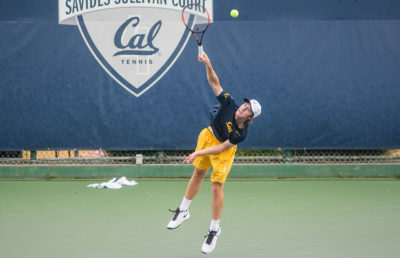 Berkeley students will have a busy week with midterms starting, and that busy week will extend to Malibu and San Francisco for Cal men’s tennis. In Malibu, senior Billy Griffith and freshman Jack Molloy will attend the Oracle ITA Masters, a highly anticipated invitational tournament, while four of their teammates — senior J.T. Nishimura, sophomore Dominic Barretto and freshmen Jacob Brumm and Paul Barretto — will attend Battle in the Bay Classic in San Francisco. All will look forward to play at their highest level, as a lot is on the line this early in the year. Griffith and Molloy are looking to continue their solid performance from last week in Napa, where Griffith went undefeated in the round-robin grouping and Molloy ended up with 2-1 with an upset against No. 96 USC senior Thibault Forget after starting the tournament with a loss. No. 49 Griffith, one of two seniors on the team, is looking to provide leadership for a very young team that features seven incoming freshmen. “Billy is sort of setting the tone for his teammates right now,” said associate head coach Tyler Browne. A tougher competition awaits both players this week, as the tournament is in single-elimination-draw format, compared to last week’s round-robin group format. Jack responded well last week to the loss in his first match and won the other two games, but he does not have the same second chance this week. He will try to use the lessons he learned to make himself a case this early in his first year. Aside from the singles competition, Griffith and Molloy will play mixed doubles games with women from UNC and Winthrop. “It’s very rare for our guys to get a chance to play with other women from across the country,” says Browne. In San Francisco, Bears will compete at Battle in the Bay for two wild card spots for the ATP challenger tournament. While players have a lot to gain this week, coaches are not very interested in the results this early in the season. 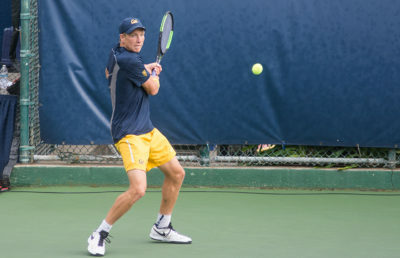 With having more freshmen than any other class on the team, the Bears are looking to develop more than anything, and the doubles games are a great opportunity for them as they match up freshmen with upperclassmen in these preseason tournaments. “For us, the coaches, we’re looking for development, looking for the big picture,” says Browne. As Cal is busy with tough competition in Malibu and San Francisco, coaches are looking for constant development as they aim to peak in the Regionals in October. Sometimes, high motivation might turn to high pressure. We will see if the Bears are ready to perform on the line this early in the season. Can Sarioz covers men’s tennis. Contact him at [email protected].